Meri Barnes founded The Shop Forward in 2014 with the simple idea of creating a platform to fundraise for important causes through apparel and accessories. The Shop Forward serves as a marketplace for totes, t-shirts, hats and other items which all support programs and organizations that are effectively working to help others around the world. Each donation is built into the retail price, so an exact and tangible donation is made for each item sold. Since launching in November 2014, The Shop Forward has raised more than $2.3 million for various charities around the world, helping raise funds and awareness while offering high quality and unique products. Recently, this model has been used to assist those affected by Hurricane Harvey and the California wildfires. 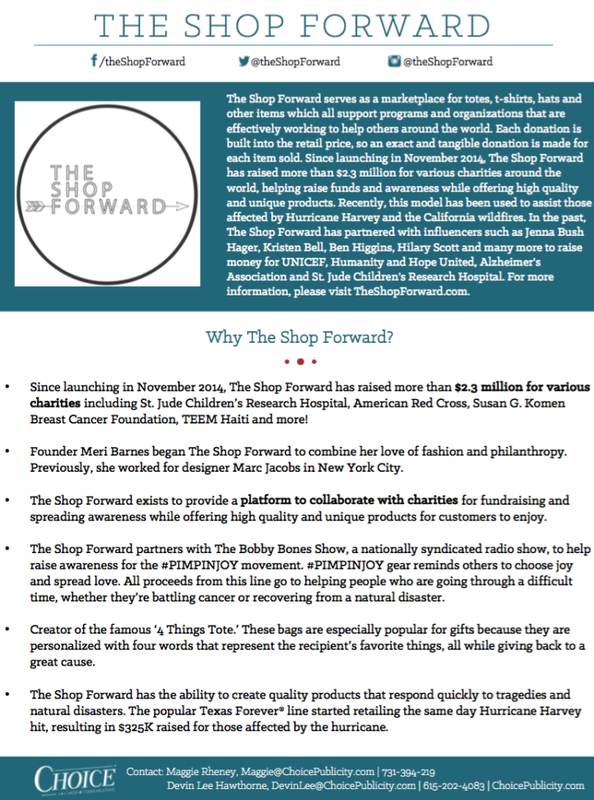 In the past, The Shop Forward has partnered with influencers such as Jenna Bush Hager, Kristen Bell, Ben Higgins, Hilary Scott and many more to raise money for UNICEF, Humanity and Hope United, Alzheimer’s Association and St. Jude Children’s Research Hospital. Meri lives in Southern California. For more information, please visit TheShopForward.com.